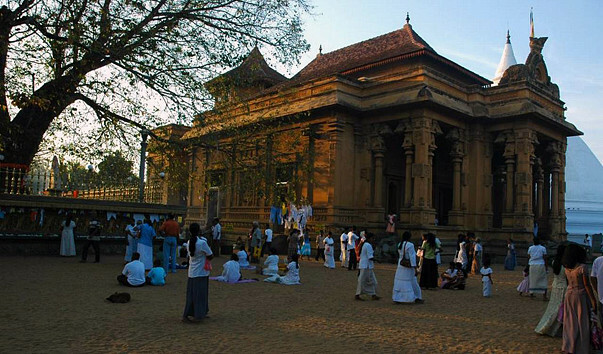 The King Yatalatissa in the third century, as per the early history, built the city of Kelaniya along with the Kelaniya Raja Maha Viharaya (Kelaniya temple). It was during the reign of the King Voharikatissa that the original paintings on the shrine walls were added. In accordance with the text of the Mahawamsa (ch. 85, 64-72) the King Panditha Parakramabahu II (1236-1271) carried out extensive renovations at this temple. These renovations were so effected as an invasion from South India in the year 1213 led by Kalinga-Magha resulted in the destruction of several shrines and temples in the country including the Kelaniya Raja Maha Viharaya. King Vijayabahu III also renovated the viharaya as the invading Tamils destroyed it. In the year 1505 the Portuguese after invading the Maritime Provinces destroyed this temple and several others under the influence of the church. The King Kirthi Sri Rajasinghe, who again rebuilt the Viharaya in the year 1767, after it had been abandoned for 200 years. The Dutch who followed the Portuguese persecuted Buddhists who came to worship there, sometime later after the mysterious death of King Bhuvanakabhahu VII, his grand-son Dharmapala ascended to the throne of Kotte in 1551. He was a very weak and treacherous King who after having embraced the Catholic faith baptized himself under the name of Don Juan Dharmapala and issued a proclamation in 1555 handing over the Kelaniya Temple revenue lavishly for the maintenance of Catholic Schools. Portuguese had demolished the temple statues and also done immense destruction to the Kelaniya Dageba. In the year 1930, this Viharaya received the attention of Mrs. Helena Wijewardena who commissioned the famous temple artiste Solius Mendis to restore the interior of the Viharaya to its former glory, who devoted 20 long years to beautifying the place with fascinating paintings depicting the life of Buddha, history of Buddhism and the history of Kalaniya with its enriched culture the history of the existing paintings here. First of all Mrs. Helena Wijewardena sent Solius Mendis to the Ajantha, Ellora and Bagh caves to study the paintings and gain inspiration. He came back inspired and fired by the masterpieces in these Buddhist caves. However there is nothing to witness them. There is not even a photograph of them.